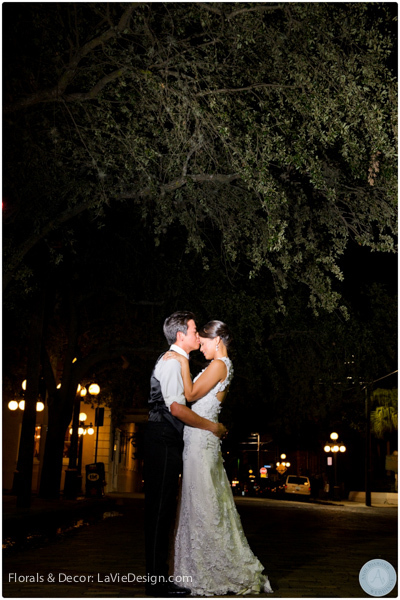 Elizabeth and Darryl’s wedding ceremony at Sacred Heart and the reception was at The Cuban Club in Ybor City Tampa. 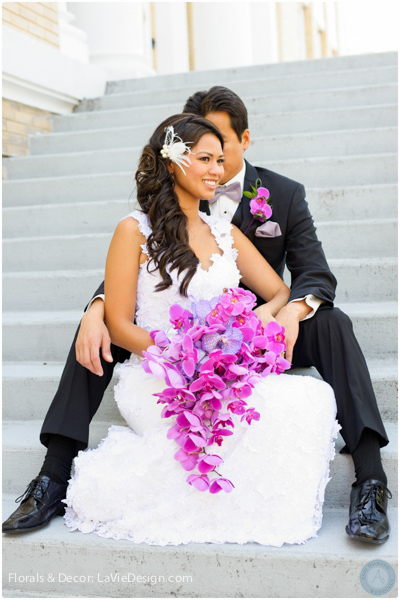 This couple’s love of Orchids were dominant throughout their wedding. 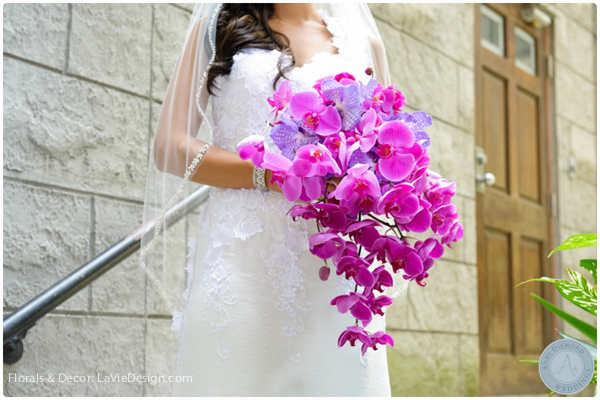 We used four exotic varieties of Orchids…Vanda, Phalaenopsis, Mokara, and Dendrobium. Jackie from Table 6 Production did a wonderful job at planning and coordinating the day. We would also like to thank Andi Diamond for these stunning images. To see more photos click here. 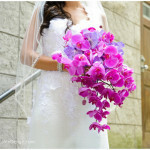 The bride had a very beautiful cascading bouquet of Vanda and Phalaenopsis Orchids. 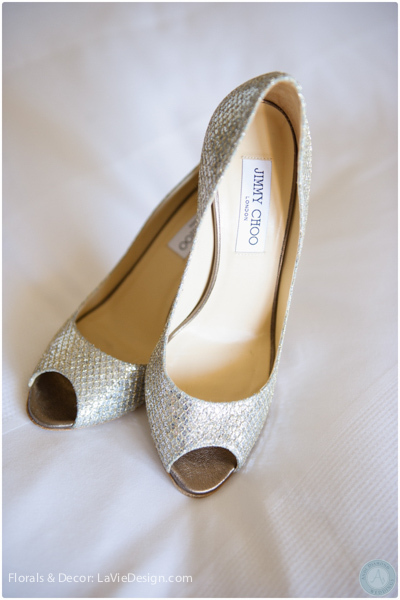 Who doesn’t love Jimmy Choo shoes! 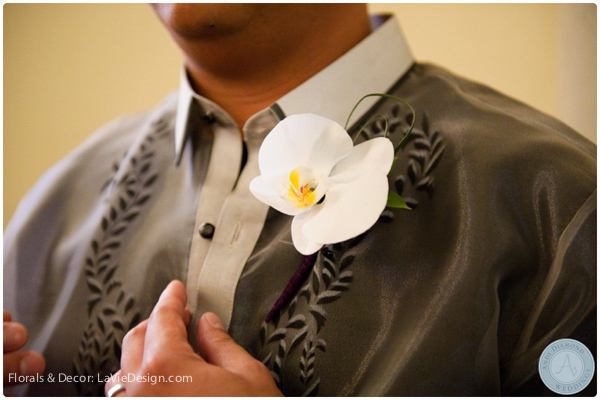 The groomsmen’s boutonnieres were a Phalaenopsis Orchid. 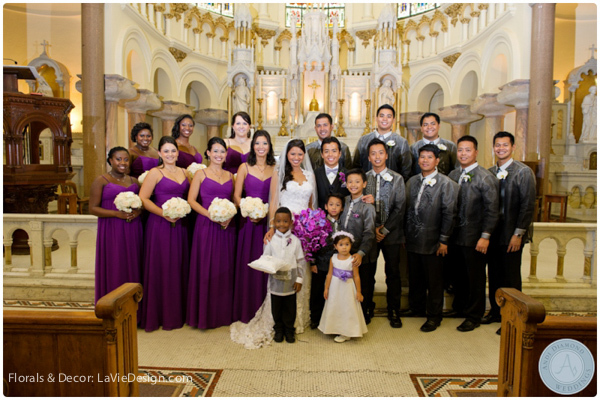 All the groomsmen wore traditional Filipino attire. 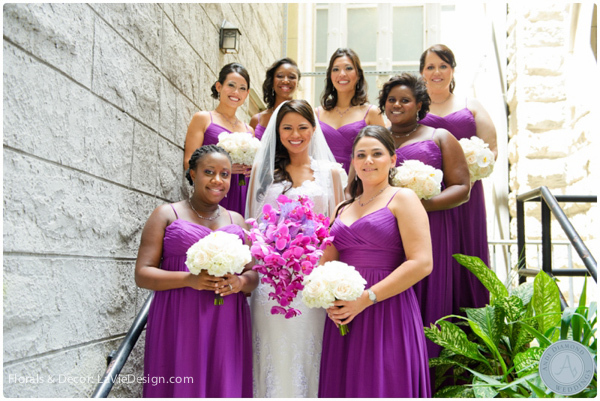 The bridesmaids looked stunning in their aubergine dresses. 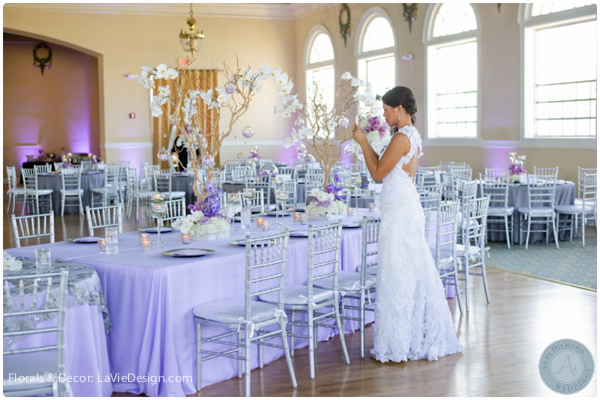 Taking a moment to bask in the joys…notice the grooms boutonniere mirrors the brides bouquet. It’s always nice for the bride to take time to enjoy the reception decor before guests came into the room. 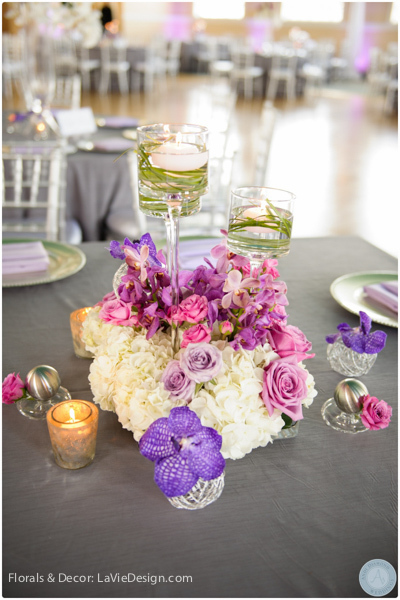 The centerpieces had Phalaenopsis, Vanda Orchids, roses and Hydrangea. We added our hanging glass globes with flower petals to these branches. 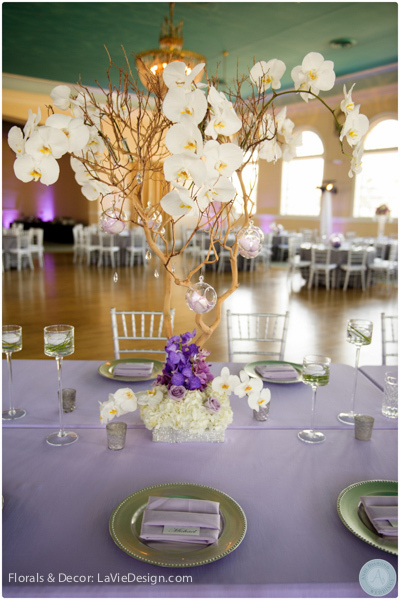 Unique details such as wire balls were a great way to showcase beauty of the Vanda Orchids. 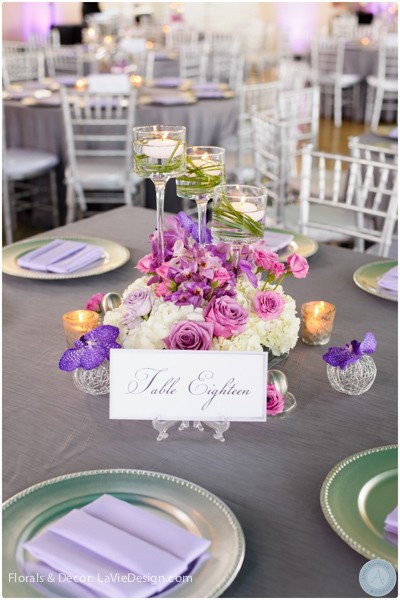 Varying heights of candle stem vases with Bear Grass and floating candles added romance to the evening. 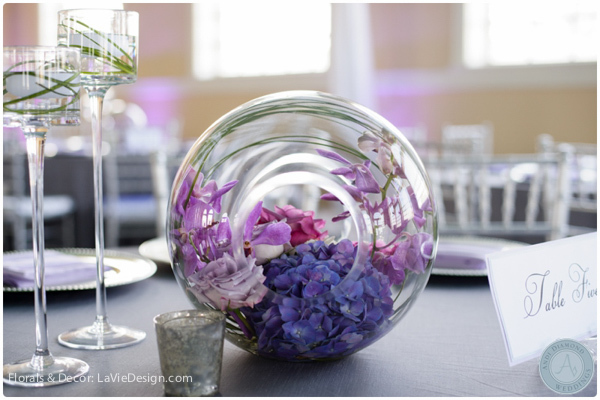 Larger glass globes filled with Orchids and Hydrangea provided a visually unique centerpiece. 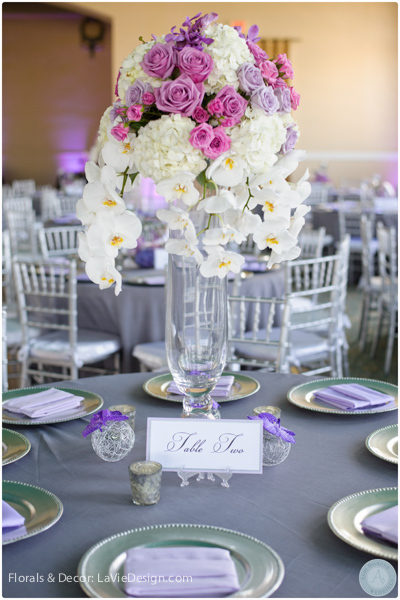 Cascading Phalaenopsis Orchids created drama to the table. 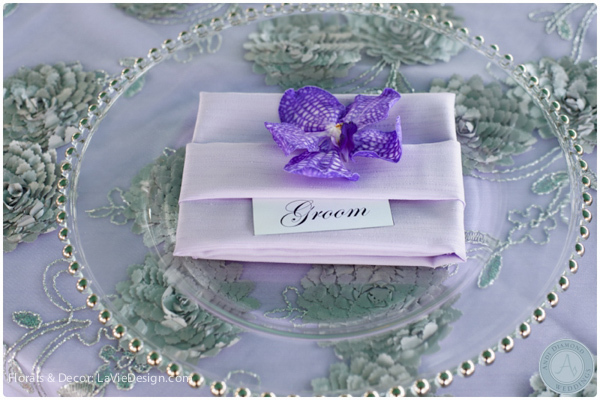 Our silver glass beaded chargers topped with a Vanda Orchid bloom added luxury for the bride and groom’s sweetheart table. 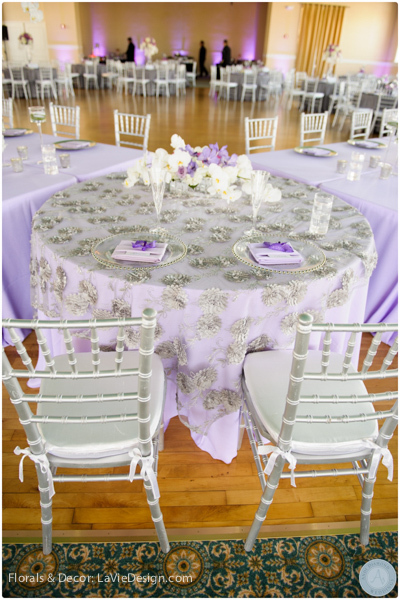 Our exclusive lace overlay helped define the sweetheart table as a focal point. 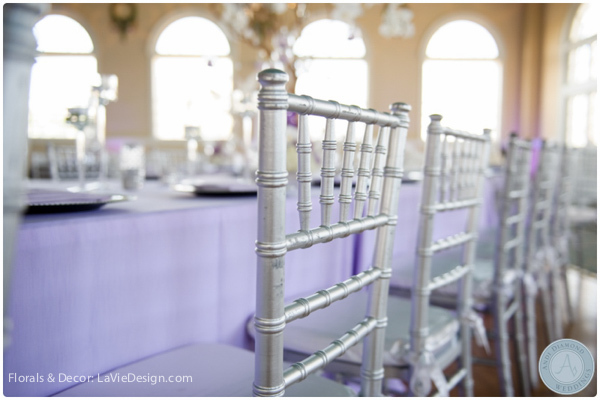 Silver Chiavari chairs adds a lightness to the room. This scrumptious cake table provides another opportunity to use this specialty rosette linen as a canvas to elevate the cake. 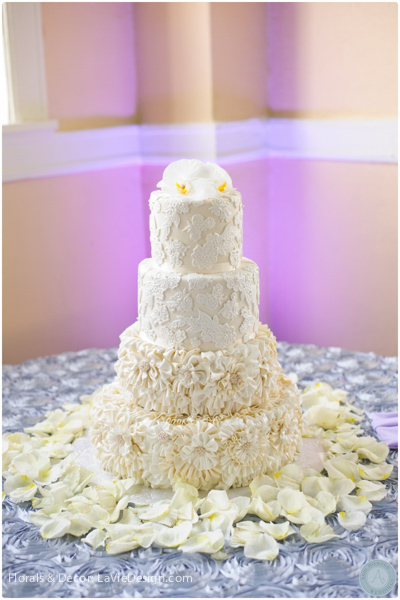 Notice how the cake pattern was inspired by the bride’s lace gown. 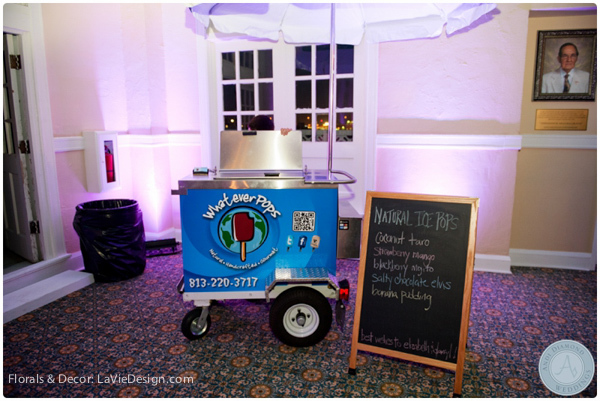 The bride and groom wanted an added treat for all the guests at the end of the night.